It’s something you need throughout various stages of your life: a great idea. You need it to get your dream business started. It’s going to be the subject of your next novel. The breakthrough discovery you make will finally help your toddler learn to share toys with other kids. This idea will improve your relationship by helping your partner cope with tedious work schedules. Regardless of what you may be needing this coveted idea for, you know that old ways of thinking simply won’t do. If you look through the places where you’ve always looked, the same thought processes will be kickstarted and the same paths will be explored. You need something new, fresh and exciting. Something that will be more effective, more targeted, and more ground-breaking. It’s cliché, but you need to get out of your comfort zone and think outside of the box. This would be an excellent opportunity to explore your creativity and go through different channels to find the information you need to arrive at a great new idea. One of the best things you can try to help you in this journey toward finding that elusive new idea is guided imagery. Guided imagery pertains to a wide range of techniques that help you create a mental image that makes use of all your sensory qualities at the same time—that would mean your senses of sight, hearing, smelling, tasting, and touching. The techniques involved include visualization, storytelling, role playing, fantasy exploration, drawing, dream interpretation, and other such methods of utilizing the senses to paint a vivid, more dimensional mental picture. Guided imagery helps you slip into a relaxed state of mind and tap into the treasures that can be found within your unconscious mind: ambitions, goals, appetites, beliefs, perceptions, values, and the like. In this state, you can exercise greater focus on images that are related to the particular situation you require a fresh new idea for, like an advertising pitch or a new original recipe for an upcoming family feast. 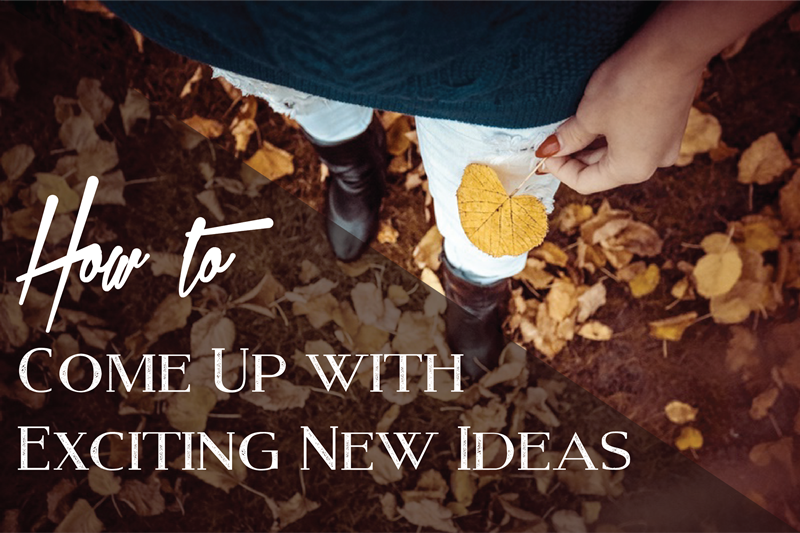 To help you better utilize guided imagery in your journey toward finding that great new idea, it helps to try some new things as well—these can help provide you with sensory information that can instruct your visualization later on. Reading more. You don’t have to stick to books when there’s plenty of reading material to be found everywhere: billboards, brochures, children’s magazines, blogs, classifieds. You may just find inspiration in words from materials you’ve never explored before. Take a walk. A quick pass through the city park or a leisurely stroll through a vineyard in the country opens you up to so many vivid images of nature, people, the weather, and other elements, all of which can inspire you to formulate new ideas. Interact with people outside of your usual circle. Throwing yourself into an activity with new people can help you gain new experiences, conversations, and exchanges.